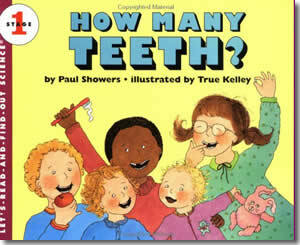 Kids Dental Health Books - How Many Teeth? Home > Holidays > Dental Health Month > Kids Books > How Many Teeth? But you won't keep these teeth forever. First one, then two, will wiggle loose. Maybe you've lost some of your first teeth already. When the little teeth come out and the big teeth come in, everyone can see - you're growing up.